Though we now have the internet, email and digital file sharing, paper-pushing isn’t yet an anachronism in the modern office. In fact, we’re printing more paper than ever even though we’re increasingly digital. Yet the cost to secure, maintain and properly dispose of the paper only goes up over time. Fortunately, there are ways to address the problem. Here are seven easy ways to reduce paper consumption in your office. 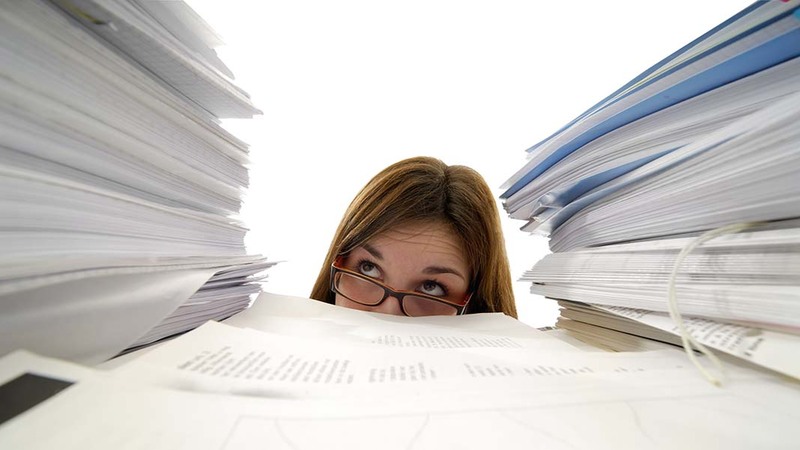 If you want to get your team to reduce their paper usage, show them the associated costs. If you can show them how much your company spends on paper, ink, printers and paper waste disposal, they may start reducing their paper usage on their own to save the company money. Demonstrate the environmental impact, and many more will do so for the sake of sustainability. Have team meetings discussing how people can use less paper. Some records may need to be kept in physical form like financial statements, but many others may be unnecessary once everyone knows how to access them online. Inform team members of what records must be printed and saved so they don’t print things out that end up getting tossed. Discuss the benefits of printing things in a smaller font and thinner margins; they’ll print fewer pages overall. Encourage employees to print on both sides of the paper if they do need to print something. And discourage printing things they hope coworkers are interested in—send a link instead. A little change that makes a big difference is removing printers from cubicles and consolidating the print jobs in one centrally located printer. If you have to get up and walk to the printer, you may decide not to print it. It becomes harder to print off 20 extra handouts if the next person is waiting in line behind you too. Ditch the department newsletter, and send out a department wide email instead. Post company policies on an internal website instead of printing and distributing copies. A side benefit of this is that everyone has to refer to the latest and greatest information on the site instead of circulating old printed copies. Send memos as emails instead of printed or written papers. Encourage people to give meetings via PowerPoint instead of handing out printed handouts. When someone sends out the meeting agenda via email, it is harder to lose and more readily shared. If someone seems unavailable via email, remember the traditional alternatives of picking up the phone or walking into their office. If you can’t run the office without paper, you can still make changes that result in less paper usage. Switching to lighter stock paper means you’re using less paper overall. Another strategy is avoiding printing on specialty stock and coated paper unless it is truly necessary, such as when you’re printing brochures to give to your clients. While you may be generating new records digitally, it is possible that your old records remain in paper form. This form of archiving and data storage can even generate new paper as people print off forms for storage. The solution here is switching to digital archiving. Work with your IT department or services provider to create multiple digital backups of your data so that it cannot be lost. Then you can stop printing off digital records to ensure that they aren’t lost. If you are afraid that critical files may be lost, save them to external hard drives and thumb drives that are stored off site. You could start scanning old paper records and back up those digital files, allowing you to whittle away at that massive collection of paper files. Instead of sending printed purchase requests and purchase orders, switch to electronic transactions. A side benefit of this change is gaining faster access to the funds, since direct deposits are processed much faster than paper checks. This can make a major difference in businesses that do a lot of purchasing. Switching to electronic workflows for the review and approval of documents could reduce how many documents you print off and throw away, too. A truly paperless office is an eco-friendly office. You don’t have to worry about securing printed records or managing a lot of paperwork. Designing a digital office from end to end improves information security, since no one should be able to print out sensitive records and take them home or worry about people stealing personally identifiable information left in a stack to be shredded. If you want to know more on how to go paperless, you can check out this blog post on an eco-friendly office for inspiration. They bring up practical ways to reduce printing like encouraging people to get digital pay stubs generated by human resources systems for instance. Most of these tips won’t make a huge difference in how much paper you use at first. However, you’ll save money on paper and supplies immediately, and you’ll reduce a number of associated costs over time. You’ll enjoy peace of mind knowing you saved a number of trees in the process. Jenna Hilton is a recent Business and English graduate that has earned her CIPD. She is currently looking to combine both aspects of her degree by focusing on writing about topics that focus on the most important part of any business, its employees.